A pioneering engineer from a technology leads business and a celebrated cardiac surgeon are among a line-up of experts who will reveal how Tees Valley businesses can benefit from ideas generated in some surprising places. Organisers of the area’s innovation conference VentureFest Tees Valley announced the first of their speakers for the event which takes place at Wynyard Hall on September 13. In true VentureFest spirit, the headliners will share personal experience of lending and borrowing ideas and learnings from one business sector to benefit another. 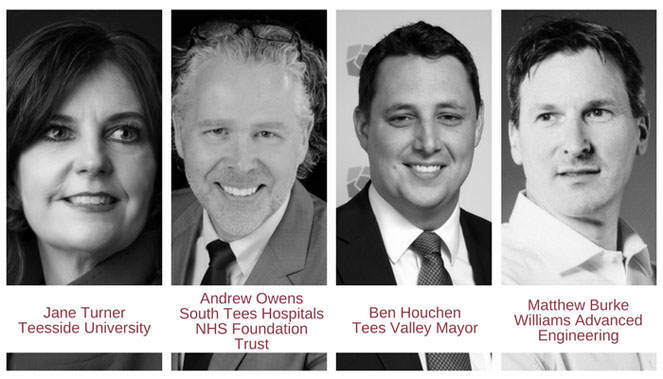 The first of a whole series of experts to be confirmed for the autumn event are Matthew Burke, Williams Advanced Engineering; Professor Andrew Owens, South Tees Hospitals NHS Foundation Trust; Professor Jane Turner, Pro Vice-Chancellor for Enterprise and Business Engagement at Teesside University; and Tees Valley Mayor Ben Houchen. More details about the speakers is below. Mayor Houchen said: “I know the importance of innovation from my own business experience and I’m really looking forward to discussing this with delegates in my role as event speaker and Tees Valley Mayor. Venturefest Tees Valley aims to attract 400 businesses, entrepreneurs and innovators from across the Tees Valley to share ideas, explore opportunities, grow new networks and raise investment. The event’s founding partners are Innovate Tees Valley, Tees Valley Combined Authority and the Knowledge Transfer Network. It receives funding from the £6.5m Innovate Tees Valley programme, led by Teesside University with partners NEPIC, the Materials Processing Institute and Digital City and is part-funded by the European Regional Development Fund. The technology developed for the race track by the Williams Formula One team is being transferred across to the Williams Advanced Engineering team and is being used in a number of other sectors through from Sports Science to Defence, Aerospace and Energy. Recently, the Advanced Engineering team used some of the lightweight technologies employed in Formula 1 to design and develop a light weight incubator for use in the transport of critically ill babies. In his role as Head of Technology Ventures, Matthew Burke also plays a key role in supporting new, disruptive tech businesses through from the critical start-up phase to full commercialisation. Professor Owens is a consultant cardiac surgeon and Director of Education, Research and Innovation at the South Tees Hospitals NHS Foundation Trust, one of the largest acute trusts in the UK with a turnover of approximately £500 million, 9000 employees and providing a full range of clinical services to a population of over 1.5 million. He uses this insight from the frontline of the operating theatre to develop niche medical devices for patients and healthcare professionals. A solicitor by profession and a businessman in his own right as former CEO of sport clothing company BLK in Stockton, will draw on personal experience when he reveals how important innovation is to the local economy. Professor Turner will open the event with words of experience from her role of encouraging collaboration and knowledge exchange to nurture Tees Valley’s spirit of innovation.